Since 2008, the local electricians that residents of the Southborough, Massachusetts, area have relied on for top-notch electrical installations or repairs have been the knowledgeable pros at VMA Electric. 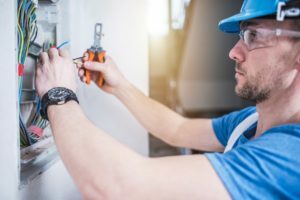 We’re a full-service electrical contractor that specializes in custom work, and we have the expertise needed to handle your job, no matter how large or small. The licensed electricians on our staff average more than a decade of experience, and they stay current on industry trends and advancements to make sure our customers receive the highest level of service possible. What’s more, our owner – Victor Archila – oversees every job we do to ensure that the work we provide meets the standards our clients deserve. And, because you can never predict when emergencies that require the expertise of local electricians might occur, we have someone on call 24 hours a day. That way, if an outlet starts sparking or your home suffers an outage, we will be there to help. Contact VMA Electric today to see for yourself why we stand out from the other local electricians that serve Southborough, MA, and the surrounding communities.